We just got back from the Pumpkin & Arts Festival down in Half Moon Bay. Surrounded by all things pumpkin: pumpkin bread, pumpkin rolls, pumpkin pie, pumpkin pancakes, pumpkin ice cream, pumpkin sausages…… boy did I get a hankering for all those delicious winter squashes. 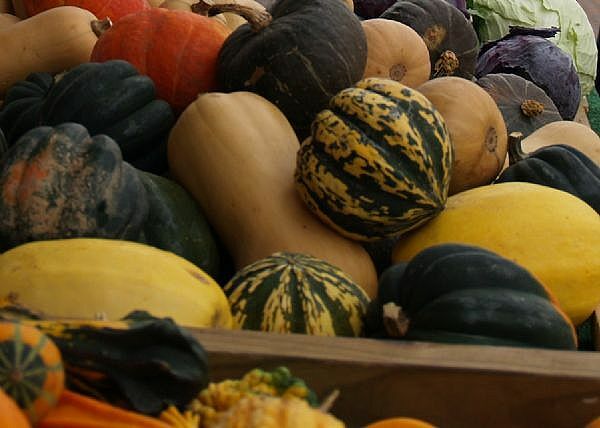 Butternut, acorn, delicata, spaghetti squash and sugar pie pumpkins. Yum! We stopped by a pumpkin patch on the way home, and aside from pumpkins for carving, I got butternut and acorn squash for eating. Top cooked winter squash with cinnamon and maple syrup. Slice in half and bake at 350 for 30-45 minutes, or steam for 7-10 minutes. Steam cubes of winter squash and then dress with olive oil, tamari, ginger and pumpkin seeds. Top “strings” of spaghetti squash with pasta or pesto sauce. Add cubes of winter squash to your favorite vegetable soup recipe. Puree cooked butternut with cinnamon, butter, and a green apple for a delicious and smooth butternut soup. Pumpkin curry is delicious. So is pumpkin pie! And pumpkin cheesecake. Mmmmmmm. Stay tuned for Thanksgiving time. I’ll post my great pumpkin pie recipe. In the meantime, try this stew. It is delicious and nourishing and even better the next day, as is often the case with soups and stews. This sounds labor intensive, but it’s pretty easy and WELL worth it. Great for those cold autumn nights and for lunch on crisp days. Preheat oven to 400°F. Coat baking sheet with olive oil. Arrange carrots, tomatoes, onion, squash and garlic on sheet. Drizzle with more olive oil. Sprinkle with salt and pepper. Toss to coat. Bake until vegetables are brown and tender, stirring occasionally, about 45 minutes. Transfer carrots and squash to work surface. Cut into 1/2-inch pieces; set aside. Place garlic, tomatoes and onion in blender; puree until almost smooth. Pour 1/2 cup broth onto baking sheet; scrape up any browned bits. Transfer bits and vegetable puree to large pot. Add broth, kale, thyme and bay leaf to pot; bring to boil. Reduce heat; simmer uncovered until kale is tender, about 30 minutes.